I have many happy memories of playing in the early days of the Evian prior to its elevation to major status. It was always a classy affair with top notch accommodation, courtesy cars, wonderful off-course activities, no cut and a very hefty prize fund. There are simply some things that the French do better than anyone else and the Evian thoroughly deserves its reputation of being the women’s equivalent of The Masters. If I were able to turn the clock back and was allowed to play just one more tournament, it would have to be The Evian. My fondness for France goes back a long way and I had an inordinate number of marvellous experiences in that country when playing on tour. 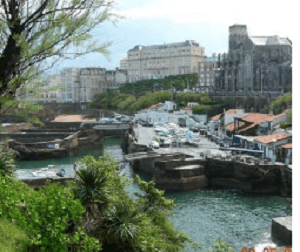 One of the tournaments towards the end of each season was the Biarritz Open played down in Mare-Laure de Lorenzi and Sandrine Mendiburu country. In the late 1980s I was playing in the pre-tournament pro-am on the Wednesday and had been matched up with a very amenable team, one of whom was a vivacious single-figure handicapper called Danielle. As we were going up the 9th hole I noticed that a pal of Danielle’s had come out to walk a few holes with her. I was on the other side of the fairway and so was unable to greet this newcomer, who was supremely elegant and regal in her bearing. After hitting a good shot into the green I holed for birdie and we moved en masse to the 10th tee, but I was still not close enough to say hello. After a pretty mediocre drive at the 10th I promptly, and astonishingly, holed my 4-iron second shot. The next conversation changed my life. We laughed, Danielle introduced me to her friend, Sol, and we spent the next few holes chatting. We hit it off instantly – probably something to do with the fact she had an Irish mother. At the end of the round she left, declining to join us in the clubhouse. Sol turned up every day and walked nine holes with me but never came into the clubhouse once. I had a good tournament, finishing 15th, and we went on our way to the next venue. A month later I was travelling by car with members of my family down to visit my aunt who lived on the south coast of Spain. 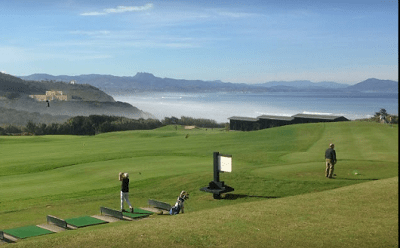 We stopped in Biarritz for a couple of days and I took my folks out to see the wonderful, clifftop practice facility that is Golf d’Ilbarritz. There, in the little clubhouse, I bumped into Danielle and Sol and before I knew where I was I had agreed to a game of golf the next day at a new course north of Biarritz. Sol organized it all, accompanying us around the 18 holes in a buggy, but not playing, and then she welcomed us all to her home for a late lunch. Hard not to lift your head to admire the views! 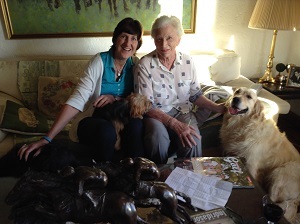 I was beginning to discover a little bit about her – she played international bridge for Spain, owned 17 dogs and “had something to do with horses”. It was at that point she invited me to come out later in the winter, stay at her house and practise at the terrific nearby facilities. That was the start of a wonderful 27-year (to date) friendship with one of the most intriguing people I have ever met. Sol, or the Marquesa de Moratalla, to give her full title, became my sponsor and remained so for the remaining eight years I played on tour. She was the largest breeder of racehorses in south-western France, owned multiple winners of The Gold Cup at Cheltenham and the King George VI Stakes at Kempton and sent numerous horses to the world renowned Kentucky Derby. Her coffee table was crammed with photos of friends who looked vaguely familiar (the Spanish Royal family); her late brother, Alfonso Portago of motor racing fame was afforded a Spanish state funeral; she was a great pal of the late Peter O’Sullevan, aka the voice of racing, and his wife Pat. Sol is a remarkable woman whose tale would fill a book and were it not for this ridiculous game of chasing a little ball into a hole our paths would never have crossed. Vive La France et vive le golf! Marta Figueras Dotti, trailblazer player and teacher and now coach to the Spanish women’s golf team at the Rio Olympics, chats with Mo Madill.